Taiwan’s Aerospace Industrial Development Corp. (AIDC) announced on 4 May that the company will supply five biogas generators to a major livestock farm located in the island’s Pingtung County. Previously, AIDC had already set up three 65kW biogas generators at the Pingtung livestock farm and four 260kW biogas generators at another large-scale livestock farm located in Changhua County. 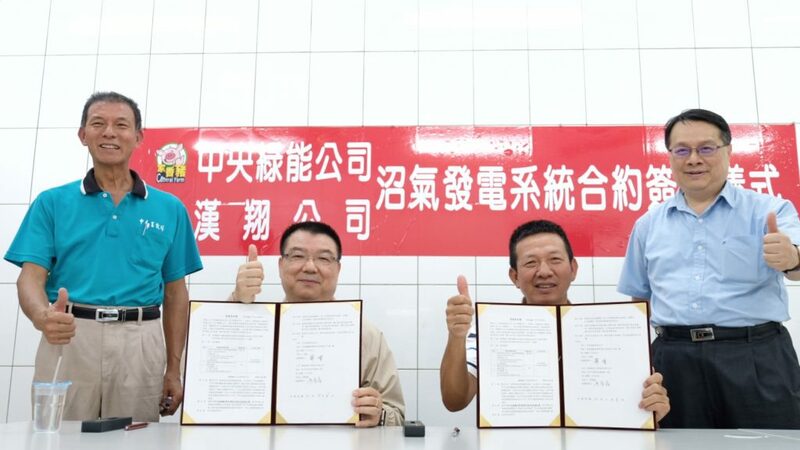 The announcement was made in conjunction with the official signing of the procurement agreement between AIDC’s Chairman Liao Rong-Xin and Su Zeng, chairman of the Pingtung livestock farm. The additional five biogas generators will increase biogas generation capacity of the Pingtung livestock farm by 325kW. 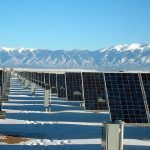 According to AIDC, the latest deal represents another significant milestone in the company’s expansion into the green energy sector. Su pointed out that developing biogas generation has become the best solution in reducing the odor and greenhouse gases emanating from large-scale livestock operations such as commercial pig farms. Su also thanked the government of the Pingtung County for assisting in obtaining the subsidy from Taiwan’s Bureau of Energy to increase his farm’s biogas generation by 325kW. The additional generators supplied by AIDC are expected to produce 2 million kWh of electricity annually and reduce 12,000 metric tons of carbon emission annually. Thus, biogas generation has an effective role in suppressing manmade greenhouse gases. 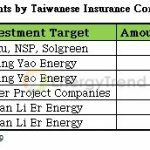 This year, renewable generation in Taiwan is subsidized by a feed-in tariff (FIT) rate of NTD 5.0161/kWh. Based on the FIT rate, the Pingtung livestock farm estimates that its biogas generation system as a whole will bring in at least TWD 10 million in annual revenue. Hence, acquiring the generators from AIDC is seen as a profitable long-term investment. Su added that the cumulative “green” electricity output from the existing three 65kW biogas generators at Pingtung livestock farm (totaling 195kW in generation capacity) has surpassed 4.46 million kWh. Currently, the farm’s daily output in kWh is around 3,700-3,800 and is used to power all of the farm’s pig sheds. The deployment of the biogas generators has not only resulted in achieving a high degree of power self-sufficiency but also led to a daily saving of about TWD 10,000 in electricity cost. Hence, the Pingtung livestock farm has decided to enter the green energy business by again deploying AIDC’s biogas generators. Su noted that AIDC’s biogas generation equipment offered numerous advantages such as low maintenance requirements, low noise level, low emission level, and high conversion efficiency. The advances that AIDC has made in this field have made possible the transformation of livestock wastes into a significant source of revenue. Su said that the biogas system that is in place in the Pingtung livestock farm allows for the safe discharge of the effluent produced by the anaerobic digestion into the rice fields. The solid wastes from the biogas generation can also be further processed to become organic fertilizer. With this system, the Pingtung livestock farm is currently applying for the conversion and certification for organic farming, as covered in a special report by the Discovery Channel. Su believes that developing renewable generation in tandem with raising livestock is a mission that his farm can pursue, though commercial pig farming will remain as the core business. Ultimately, he would like to see innovative agriculture, renewable energy, and sustainable economy as compatible goals that can be realized simultaneously in the future.